Contrasting fortunes on the Dakar today for the Peugeot Team: The squad is first and second overall after the longest day of the rally, after taking a third consecutive win on a punishing 5th stage. But nine-time World Rally Champions Sébastien Loeb / Daniel Elena were forced to retire for medical reasons, after an impact caused injury to Elena. 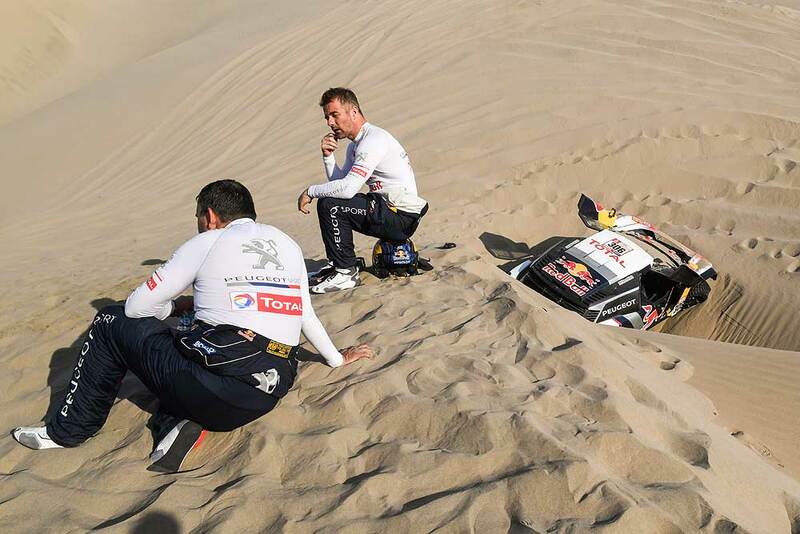 It was a very complicated start: The sand was very loose, the car just wouldn’t climb up the dunes, and we got stuck more or less straight away for 20 minutes or so," said Sebastien Loeb. "Then when we got going again, we were able to follow the tracks from everyone else, and that helped a lot. We got to a place where there was another competitor stopped on a crest: In order not to have to stop while we were climbing I went right to avoid him...but there was a hole just over the crest that we hadn’t seen. We hit it hard." "There was nothing more we could do but wait for the truck to pull us out. Daniel was in a lot of pain from the impact. We even finished the stage really slowly, in order not to make the pain worse. Given Daniel’s injury, we were left with no option but to retire." Navigator Daniel Elena reported: "We fell into a soft bowl of sand that we just didn’t see. It was a big impact. I immediately felt a sharp pain in my sternum and coccyx which didn’t go away. I was in so much pain that we had to finish the stage in slow motion. I had to stretch myself out in my seat just to avoid the pain of sitting down. Usually, I do not give up, but I really don’t feel I can continue on terrain where there are so many compressions."